Phantom Darkness is the seventh set of the OCG Series 5 Booster Packs after Gladiator's Assault. It is followed by Light of Destruction. The North American Sneak Peeks for this set took place from January 26–27, 2008. Packs of the TCG set were also printed in the Phantom Darkness: Special Edition. This is the first pack that has a Ghost Rare that is not the same monster as the cover card. 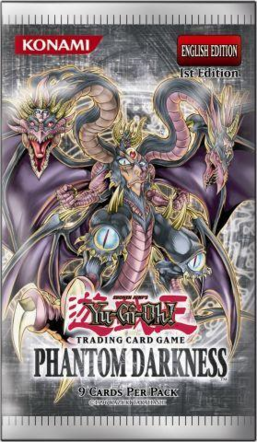 Includes cards used by Aster Phoenix, Axel Brodie, Brron, Mad King of Dark World, Jaden Yuki, Jesse Anderson, The Supreme King, Yubel, and Zane Truesdale. The TCG version also includes cards used by Deschutes Lew, Maximillion Pegasus, Tilla Mook, Yako Tenma, Yami Bakura, Yami Marik, and Yami Yugi. Includes members and/or support for the "Archfiend", "Crystal Beast", "Dark World", "Destiny HERO", "Elemental HERO", "Gladiator Beast", "Neo-Spacian", "Neos", "Six Samurai", and "Volcanic" archetypes, as well as the Effigy, Greed, Konami Arcade Games, and Spiritual Art series. Introduces the Dark counterpart and Yubel series to the OCG/TCG. Introduces the first support for the "Ultimate Crystal" archetype to the OCG/TCG. In the Japanese version there are 5 cards per pack and 30 packs per box. This page was last edited on 13 March 2019, at 14:06.